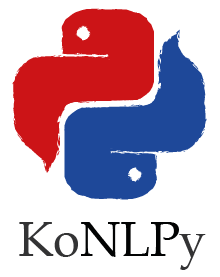 KoNLPy (pronounced “ko en el PIE”) is a Python package for natural language processing (NLP) of the Korean language. For installation directions, see here. For users new to NLP, go to Getting started. For step-by-step instructions, follow the User guide. For specific descriptions of each module, go see the API documents. Korean, the 13th most widely spoken language in the world, is a beautiful, yet complex language. Myriad Korean morpheme analyzer tools were built by numerous researchers, to computationally extract meaningful features from the labyrinthine text. KoNLPy is not just to create another, but to unify and build upon their shoulders, and see one step further. It is built particularly in the Python (programming) language, not only because of the language’s simplicity and elegance, but also the powerful string processing modules and applicability to various tasks - including crawling, Web programming, and data analysis. Make it easy. For humans. Please report when you think any have gone stale. You are welcome to use the code under the terms of the license, however please acknowledge its use with a citation. KoNLPy isn’t perfect, but it will continuously evolve and you are invited to participate! Found a bug? Have a good idea for improving KoNLPy? Visit the KoNLPy GitHub page and suggest an idea or make a pull request. You are also welcome to join our gitter and the mailing list. Gitter is more focused on development discussions while the mailing list is a better place to ask questions, but nobody stops you from going the other way around. Please note that asking questions through these channels is also a great contribution, because it gives the community feedback as well as ideas. Don’t hesitate to ask. KoNLPy is a Python package for Korean natural language processing.